vrat ke chawal ka pulao or samvat pulao recipe is a simple and easy pulao. 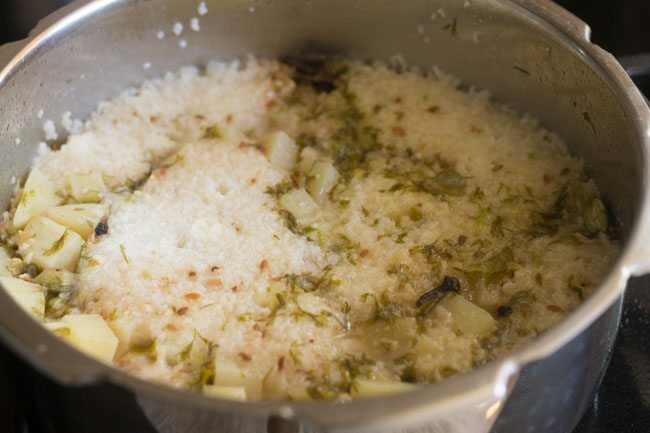 vrat ke chawal ka pulao recipe with step by step photos – this sama rice pulao is made during navratri fasting or ekadashi fasting. sama or samvat is also commonly called as vrat ke chawal. since during fasting we abstain from cereal grains and to make any rice based dishes we use samvat or sama grains instead of rice. these are not a kind of rice variety or even associated with rice. basically they are from the millet family. the english name for sama ke chawal is barnyard millet. the other indian names for barnyard millet is vari, varai, sanwa, samwa and swang. 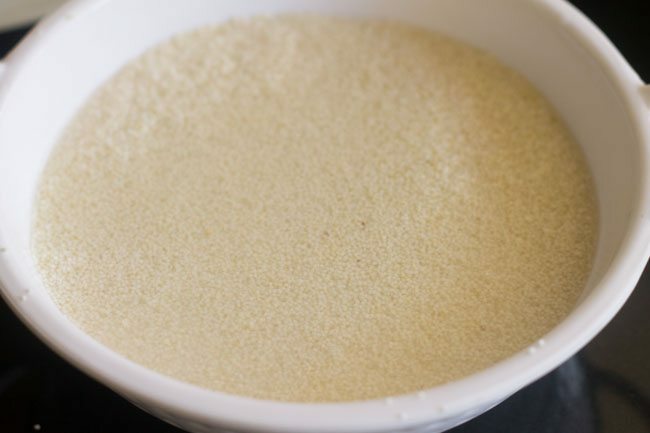 they are small tiny millet creamish grains as shown in the pic below. 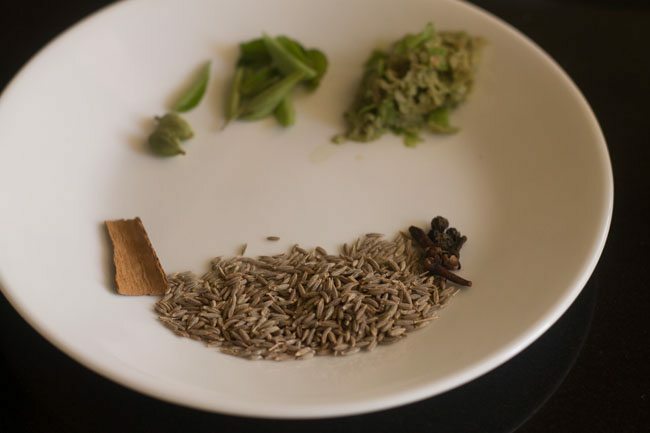 sama rice are good health option during fasting days and also make a good gluten free grain. 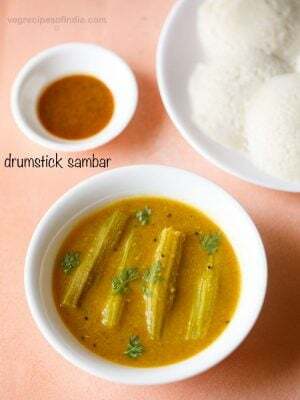 you can have them plain or with vrat ki kadhi. 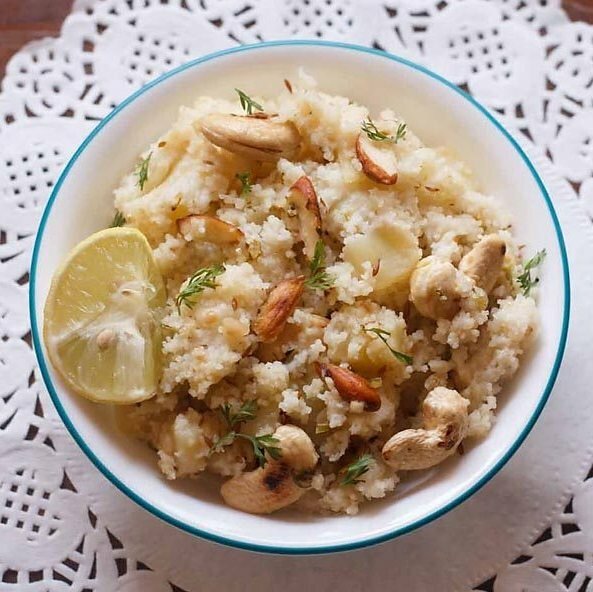 this millet is frequently used during religious fasting days in india. generally i make a simple plain rice, khichdi and this pulao from sama ke chawal. 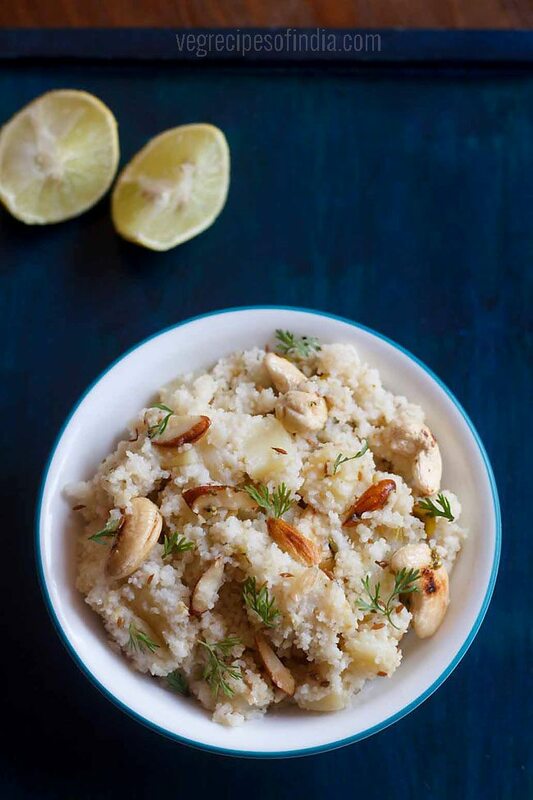 but you can also make sama ke rice ki idli, sama rice khichdi and sama rice kheer recipe. in india, fasting rules varies from community to community. its always better to check with your family members before deciding the menu. 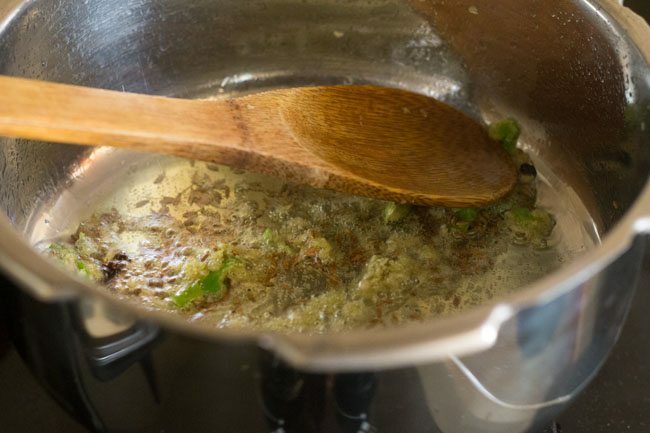 while making this samvat pulao, i have added whole garam masala and curry leaves. but some families, don’t use garam masala and curry leaves during fasting. so you can skip adding whole garam masala and curry leaves. if in doubt then please ask elders in your family about the fasting do’s and dont’s. if you are looking for more fasting recipes then do check sabudana khichdi, singhare ki puri, jeera aloo, kaddu ki sabzi, vrat wale aloo and rajgira paratha recipe. rinse the sama or barnyard millet a couple of times in water like the way we rinse rice. soak in enough water for 20-30 minutes. 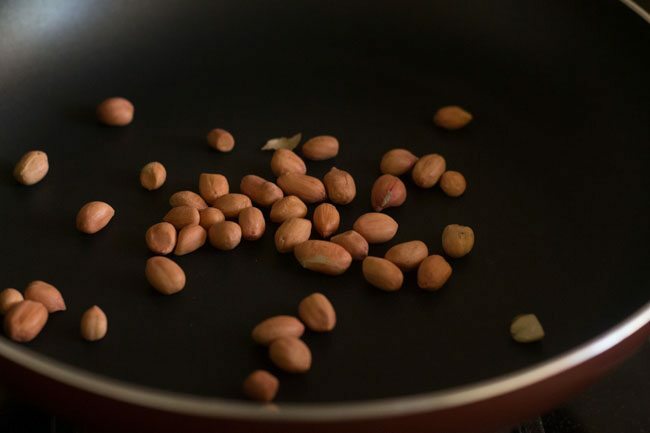 dry roast the peanuts on a pan or in the oven till they become crunchy. coarsely powder them in a mortar-pestle or in a dry grinder. add all the whole spices - cumin, cinnamon, cloves, cardamom and black pepper. saute till the oil become fragrant and the cumin crackles. add the crushed ginger-green chili and saute for half a minute on a low flame. 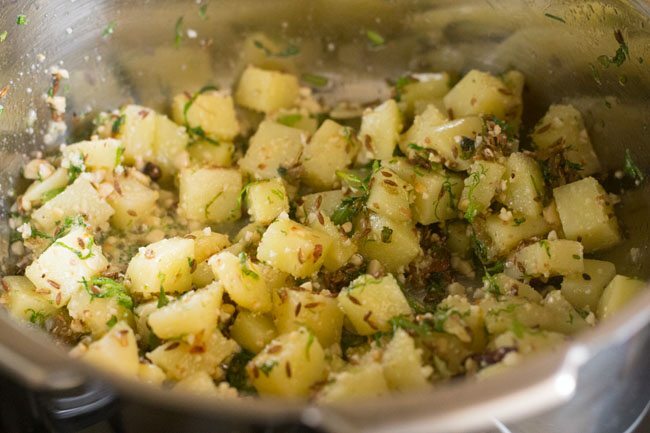 add the cubed potatoes & curry leaves, chopped coriander leaves and saute for 3-4 minutes on a low flame. now add the peanuts powder and stir. drain the sama rice and add to the sauted mixture. stir. add water and salt as required. pressure cook for 4-5 whistles or till the water is absorbed and the millet grains are cooked. 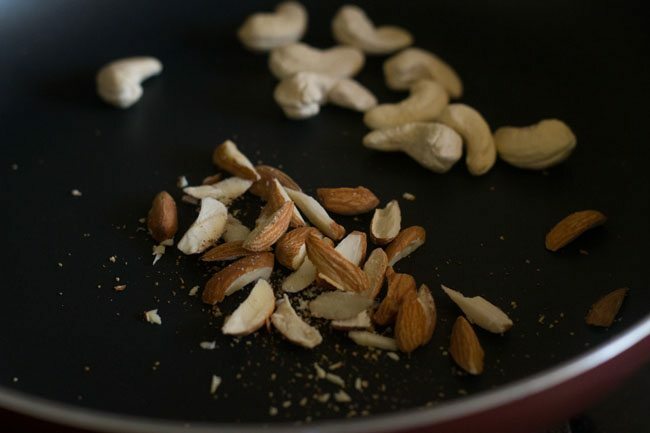 when the pulao is cooking, you can dry roast the chopped cashews and almonds. 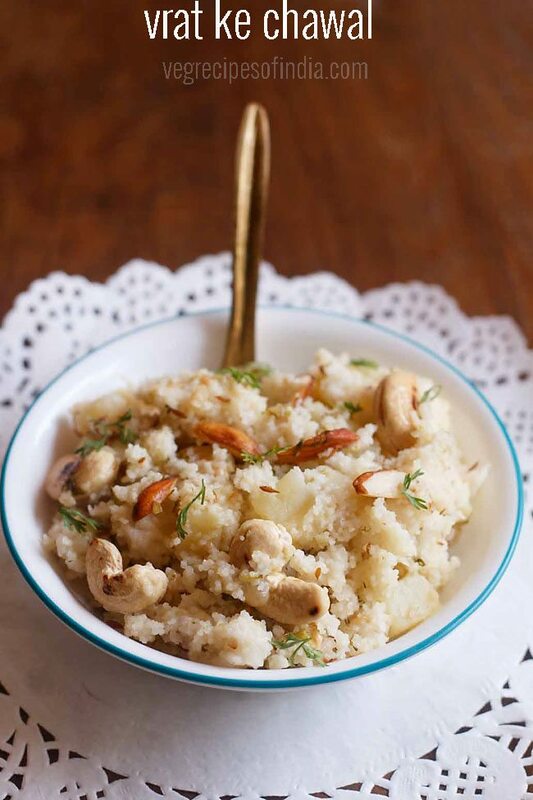 when serving the samvat pulao, garnish with the dry fruits and coriander leaves. when serving also sprinkle some lemon juice in the pulao. 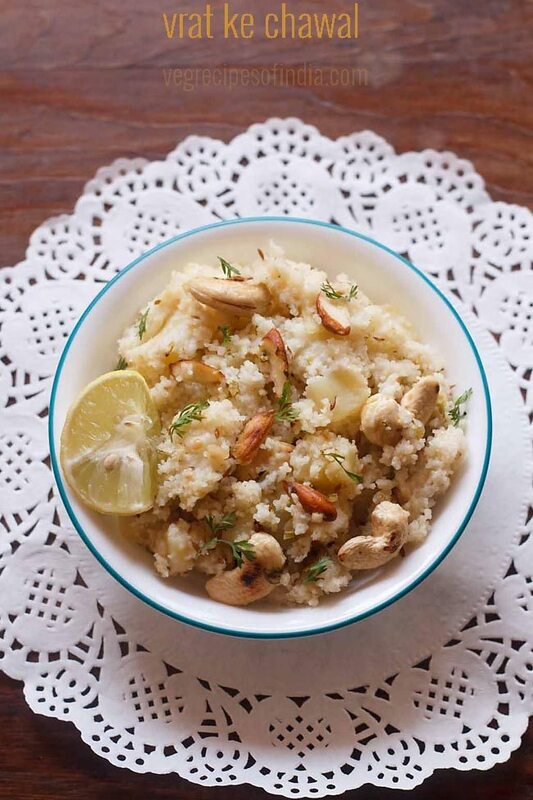 you can also keep some lemon wedges by the side of the samvat pulao while serving. 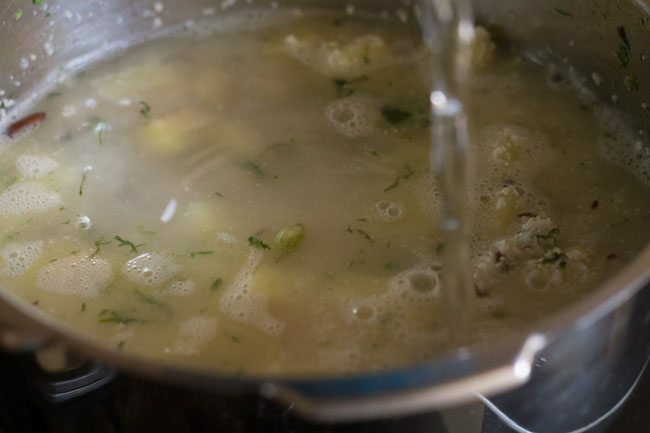 1. if you are not making the samvat pulao for fasting, then you can add peas, cauliflower, beans to the pulao. 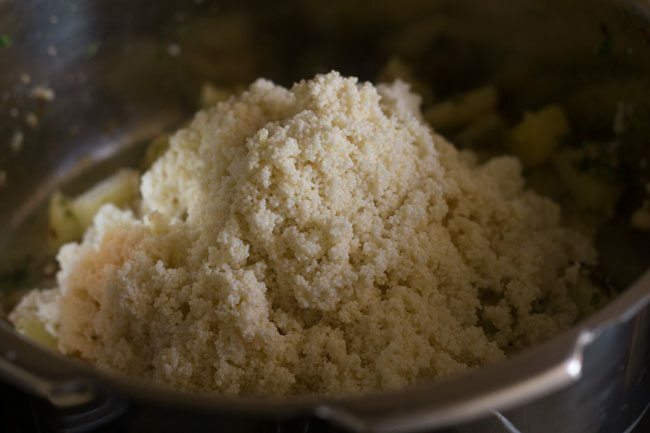 2. i wanted the millet grains to have a good soft texture so have added 3 cups water. please reduce the water to 2.5 cups for a more separate texture. 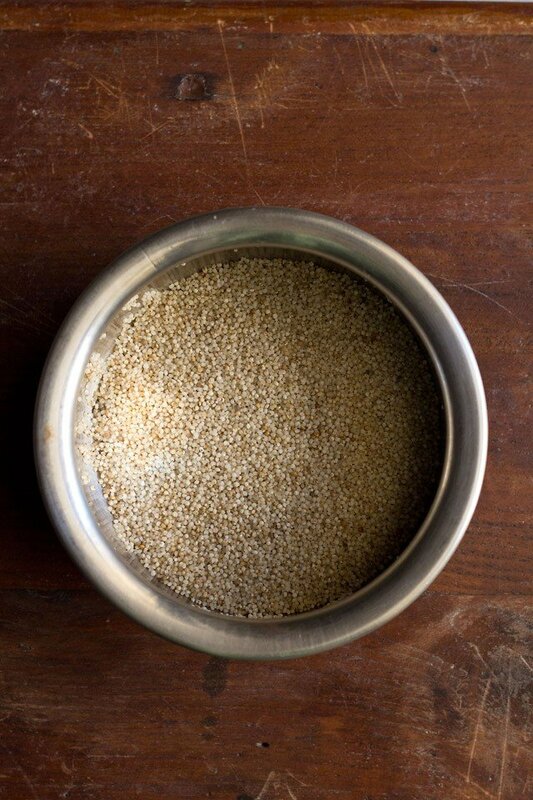 1. rinse 1 cup of sama ke chawal (barnyard millet or samvat rice) a couple of times in water like the way we rinse rice. 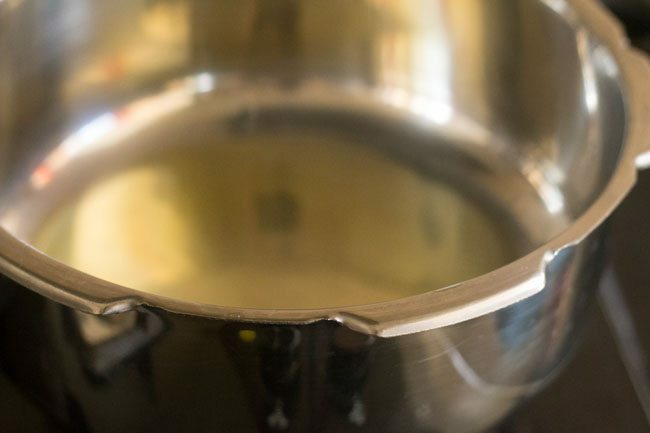 2. soak in enough water for 20-30 minutes. 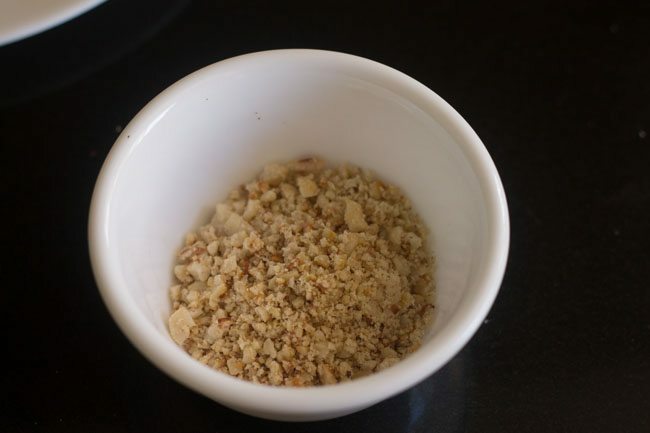 3. dry roast 2 tablespoon peanuts on a pan or in the oven till they become crunchy. 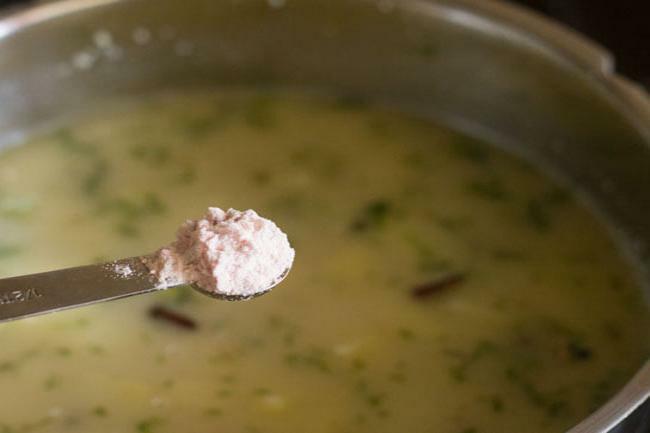 4. coarsely powder them in a mortar-pestle or in a dry grinder. 5. measure all the ingredients and keep ready for making sama ke chawal ka pulao. 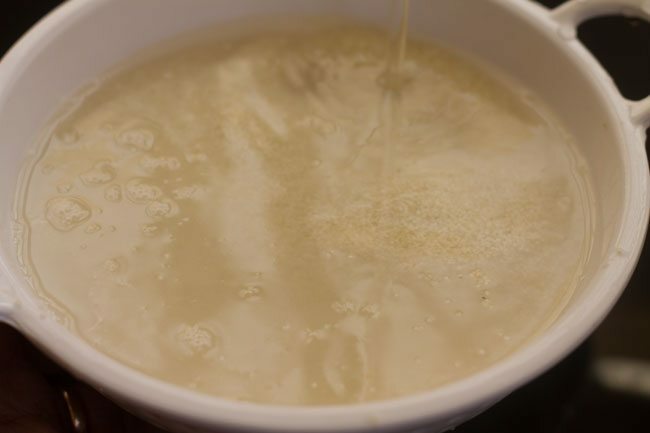 6. heat 2 tablespoon oil or ghee in a pan. i have used ghee. 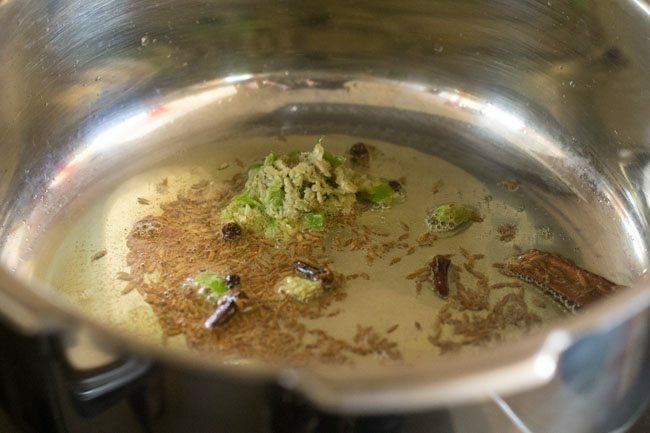 7. add all the whole spices – 1 teaspoon cumin (jeera), ½ inch cinnamon (dalchini), 2 to 3 cloves (lavang), 2 green cardamoms (choti elaichi) and 3 to 4 whole black pepper (sabut kalimirch). 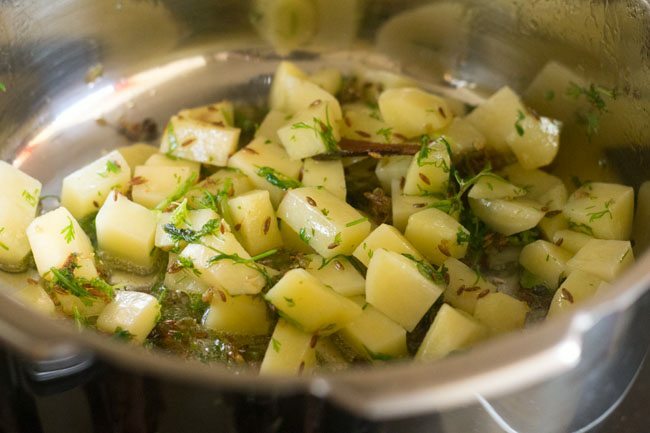 8. saute till the oil become fragrant and the cumin crackles. 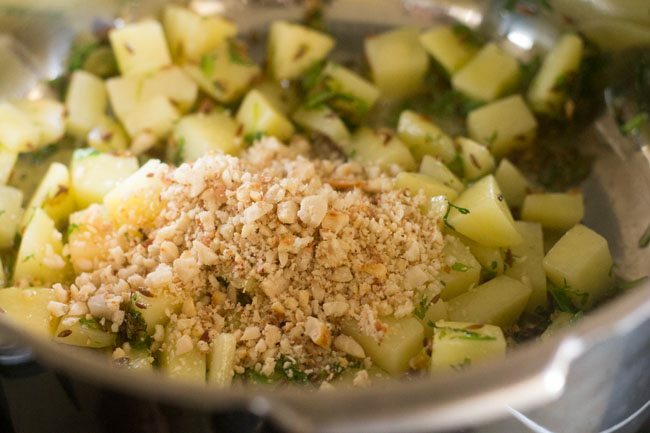 9. then add the crushed ginger-green chili paste made from ½ inch ginger and 1 green chili. you can crush them in a mortar pestle. 10. saute for half a minute on a low flame. 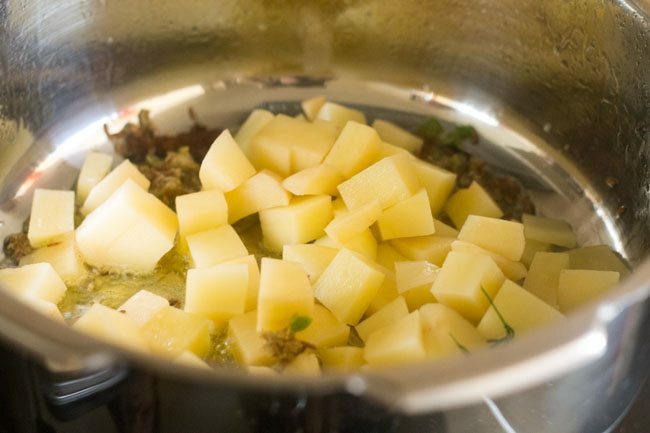 11. add 2 medium sized, cubed potatoes. 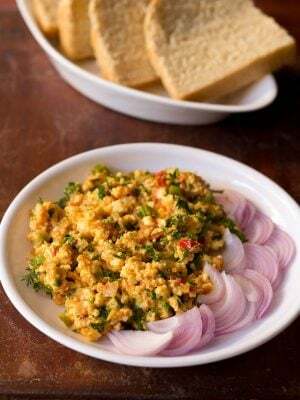 12. also add 8 to 10 curry leaves and 1 tablespoon chopped coriander leaves. 13. saute for 3-4 minutes on a low flame. 14. now add the peanuts powder. 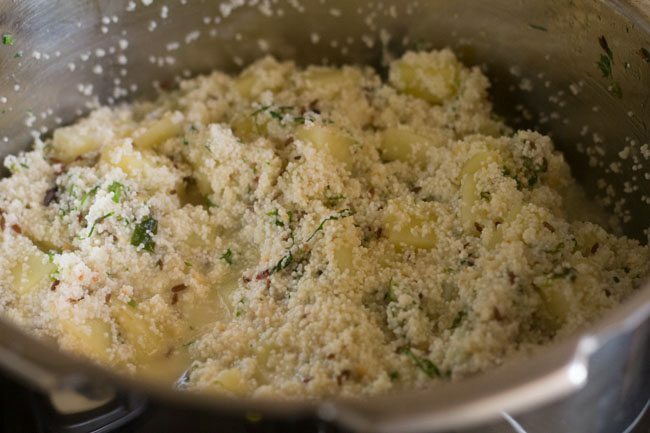 16. drain the samvat rice and add them to the sauted mixture. 18. add water as required. 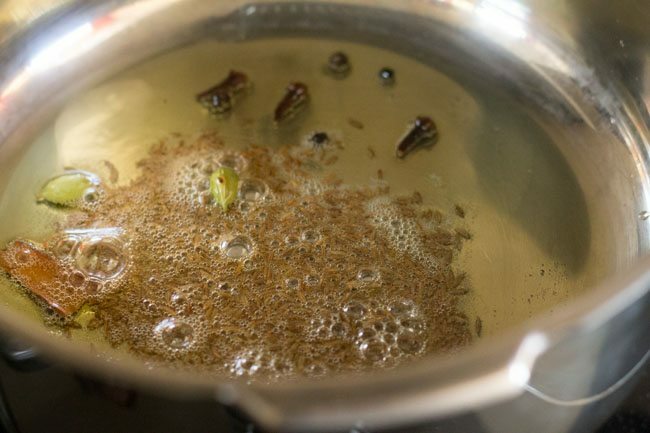 20. pressure cook for 4-5 whistles or till the water is absorbed and the millet grains are cooked. 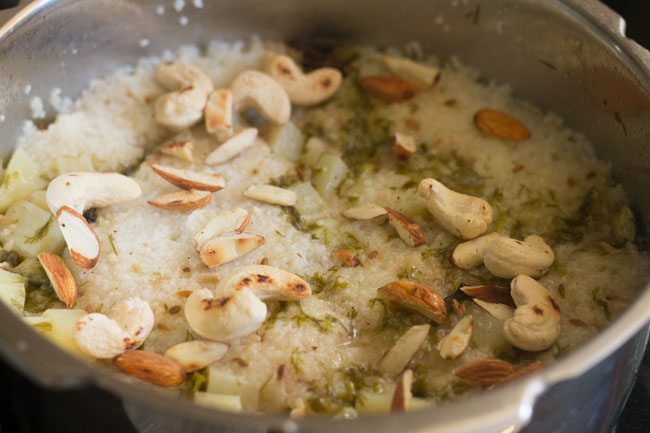 21. when the pulao is cooking, you can dry roast 8 to 10 cashews and 8 to 10 chopped almonds. 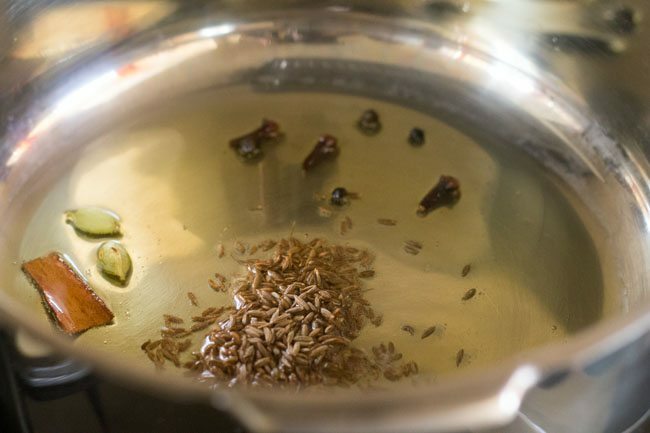 22. when serving the samvat rice pulao, garnish with the dry fruits and coriander leaves. 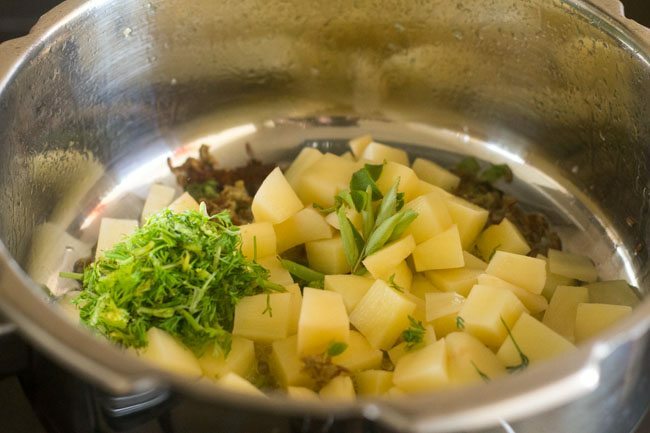 you can also also sprinkle some lemon juice in the pulao or you can keep some lemon wedges by the side of the samvat pulao. 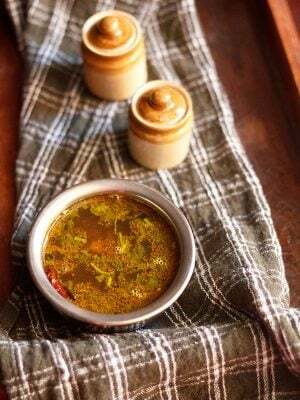 24. you can have vrat ke chawal ka pulao plain or with vrat ki kadhi or plain curd or with fasting recipes like vrat ke aloo or aloo tamatar sabzi or dahi aloo or dahi arbi or aloo palak. 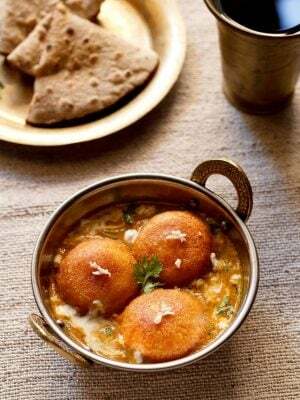 Do you have any recipe for sannas (idlis made either in mangalore or Goa) which have a sweet touch to it. connie, i have not yet posted sannas. its difficult to get toddy where we are currently based. so i have not made them as yet and not even experimented making them with yeast. thank you for the best recipes in the world! You are my endless inspiration for cooking and being patient and kind. 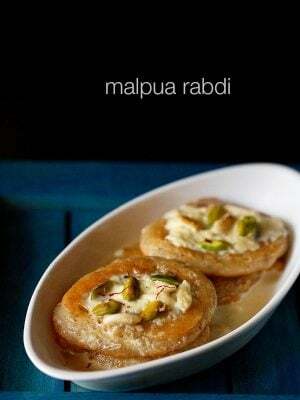 Can i ask 1 question about this recipe? in russia we traditionally cook millet with pumpkin. Can i substitute potato with pumpkin in this recipe? or it wouldn’t be good? thank you ksenia. yes you can use pumpkin. with pumpkin though, there will be some sweet notes in the pulao. I am really thankful to you for giving us unlimited and authentic recipes, I have prepared lots of dishes from your recipes and enjoyed taste of different Indian cuisine. Thank you once again, God bless you. 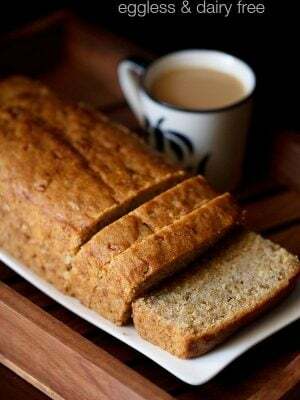 I’m a fan of your recipes n website. Hi, can we use green peas during fasting? manisha, green peas is not used during fasting. for making this pulao, you can use carrots. anshika, peas are not allowed during navratri fasting. I want to purchase the Sama Grain and Millet but cannot find it any where. If you are selling these products please give me cost of purchase and shipping. My location is Sacramento, CA 95832′. Thank you. kishor, we don’t sell any product. i suggest you to search online. The savory form of this samvat ke chawal looks scrumptious. My aunt makes this version but I used to gorge on it! This looks so good. I love your photos and your website. My husband and I moved to India from the US about a month ago, and I was definitely surprised at how different the availability of ingredients is. So I have to adapt and learn Indian cooking. I used to cook a lot in the US, but not Indian food. 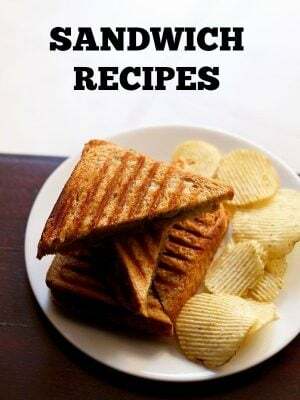 I love your recipes and a lot of them seem easy enough for me to try. It’s just a matter of finding the ingredients, which should be easy since I live in India now. 😉 I have saved several of your recipes. Thank you for an awesome website. thanks mani for the positive comment. i will wait for your feedback on the recipes. they are all tried and tested.